There is always confusion and misunderstanding regarding the differences between tracking and trailing. Although there similarities. They both require a dog, a harness and a handler. They both have three levels of competition, but the sports differ from there. The definition of tracking as stated in the AKC tracking regulations is as follows: The purpose of the tracking test is to demonstrate the dog's ability to recognize and follow human scent, a skill that is useful in the service of mankind. The definition of trailing as stated in the ABC trailing standard is as follows: The purpose of a trailing trial is to certify the Bloodhound's abilities for trailing and correctly identifying a specific person in a field setting. I would probably amend the ABC trailing standard to include the ability of a dog to "scent discriminate" as this is truly what our Bloodhounds excel at. I offer the following as my definitions of the two sports. It is important to remember we are talking about the sport of tracking and trailing. I label myself as the ultimate hobbyist when it comes to trailing! Tracking is a test of the dog's ability to follow human scent and identify articles along the way. A track (depending on the test level) can be from 1 hour old for a TD to 3-5 hours old for a TDX or VST. Tracks vary in length from 400 yards to 1,000 yards. Tracking tests the precision of the working dog. Cross runners are used on the TDX test but are not present at the end of the track. The measure and success of the test is to find the articles (gloves, wallets, socks, etc.). Trailing is a test of a dog's ability to distinguish and follow one person's scent and identify that person. The trailing tests are 4-6 hours old for a MT, 8-18 hours old for a MTI and 24-36 hours old for a MTX. The length varies from _ to _ of a mile long. Contamination is key and the MTX trail should be laid in a congested area such as in a public park or corporate center. Cross runners are used on the MTI and MTX trails and the runners are located at the end of the trail. The dog must identify the correct runner. 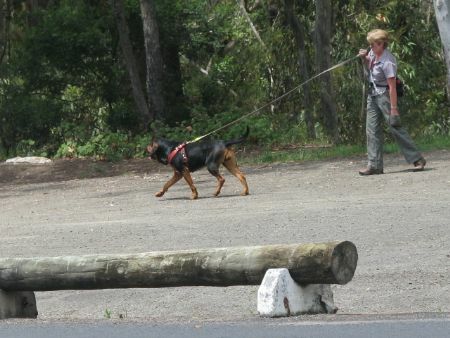 A trailing dog can air scent, ground scent or use any other means to get from point "A" to point "B" the quickest and most efficient way possible. The big question? Can a Bloodhound do both? Yes, but it ain't easy! In my experience, Bloodhounds CAN track and do so quite well when trained in that discipline. I think those of us who try both tracking and trailing will tell you to have the tracking aspects firmly established before you try trailing. The unspoken word is that a tracking Bloodhound can trail but the trailing Bloodhound cannot always track, although I believe cannot track should read "WILL NOT" track! A wise person once told me to get my Bloodhound understanding "tracking" before they turned into a Bloodhound! She was right. So, give one or both a try. My greatest pleasure is seeing my dogs in harness doing what they do best! And they do love it! After all, who's in charge at the end of a 30' lead? You got it baby...the NOSE with the dog attached!